Illinois State Senator Martin Sandoval (D-Chicago) sponsored a new law that will aid businesses owned by minorities, women and people with disabilities. The goal of this new law is to ensure that some licensee contracts are awarded to businesses owned by minorities, women and people with disabilities. Progress towards these goals will be reported as percentages of the total dollar amount of contracts awarded per calendar year. This new law will work in conjunction with the the Business Enterprise for Minorities, Females and Persons with Disabilities Act. 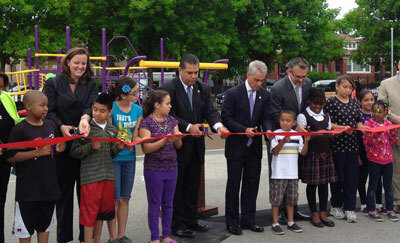 Mayor Rahm Emanuel and State Senator Martin Sandoval inaugurated the new kindergarten classrooms at Tonti Elementary School, one of the new schools benefiting from CPS instituting for the first time ever a full day of kindergarten for its over 30,000 children. “Mayor Rahm Emanuel and I have made investments in early childhood a priority for the children of the southwest side,” said Senator Sandoval. In February, the Mayor announced that Chicago Public Schools will guarantee full-day kindergarten for all students beginning in the 2013-14 school year. In previous years, students had the options of attending half-day kindergarten (between 3 to 4 hours) and a full day kindergarten (7 hours). By guaranteeing all kindergarteners a full day of kindergarten 50% more children will have a full day since Mayor Emanuel came into office. This announcement builds upon the unprecedented $36M investment in early childhood education to increase access to and raise the quality of pre-kindergarten programs for children.